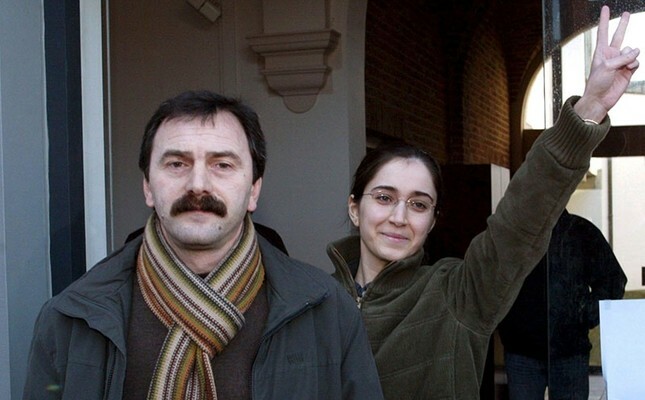 This file photo dated Jan. 27, 2006 shows Musa Aşoğlu (L) walking next to Fehriye Erdal, a DHKP-C militant who took part in the notorious 1996 Sabancı murder, while leaving the courthouse in Belgian city of Brugge. German prosecutors said Friday they have charged Musa Aşoğlu, one of the co-leaders of the Revolutionary People's Liberation Party-Front (DHKP-C) and its Europe main executive, for his leadership role in the terrorist group. The Federal Prosecutor's Office in Karlsruhe said in a statement that it charged 56-year-old Musa A., who also holds Dutch citizenship and whose last name wasn't released in line with privacy laws. However, Aşoğlu's profile is no stranger to Turks as he and two others have led the terrorist group since 2008. Aşoğlu, who has been in custody since December and was charged on Sept. 28, was previously charged with DHKP-C membership by the High State Court in Hamburg. Sympathizers to the Revolutionary Path (Dev-Yol), a predecessor of the DHKP-C outlawed in Turkey, were very active during July's violent G-20 protests in Hamburg that brought life to a halt in the northern German port city. Prosecutors in Karlsruhe say the suspect is behind several bombings and other attacks in Turkey and uses Europe as an area to procure finances and weapons. Aşoğlu is also held responsible for the group's activities in Germany. The statement said Aşoğlu has been a member of the DHKP-C since 1994 and active regionally in Belgium, the Netherlands and Britain. He has been a senior officer overseeing tasks in various European countries since 1999. From 2004 to 2006, cooperating with his wife who was later arrested, he was responsible for the group's weapon supply. He later took over management positions and supervised all of the terrorist organization's executive functions. Since 2015, he has overseen its European operations from Hamburg. Particular attention was paid to the acquisition of money for the group's activities in Turkey. The group raised more than 200,000 euros ($230,000) in the period from 2008 to 2010 alone, with large contributions coming from within both Turkey and the U.S. Since 2001, members of the group have also committed suicide attacks, a fact confirmed by investigators in Karlsruhe. The DHKP-C was founded in 1978. Purportedly supporting a Marxist-Leninist ideology, it was most active during the Cold War era. The group has stepped-up its attacks in recent years. Though less influential in Turkey than other terrorist organizations such as the PKK, the DHKP-C still represents a considerable threat with its string of attacks in recent years. The group was behind the suicide bombing that targeted the United States Embassy in Ankara in 2013, killing a Turkish security officer, and the death of a prosecutor in a courthouse complex in Istanbul in March 2015.